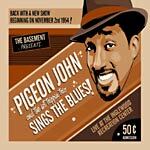 Pigeon John returns with his third album, Sings The Blues. True to the title, Pigeon John heavily sings the blues. Grouch & Eligh guest appear on ''Sleeping Giants'' and later in the album, Ab Rude and Redcloud make appearances. A must for any Pigeon John fan. This is definitely hold you down while you wait for Pigeon John's Quannum debut!!!! 7. You Can't Have It!